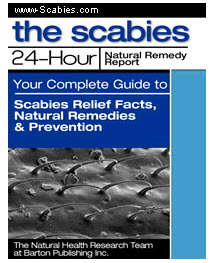 The preferred treatment for scabies is either permethrin cream (5%) or aqueous Malathion (0.5%) (41). Either treatment has to be applied to the whole body and should be left on for at least 8 hours in the case of permethrin and 24 hours for Malathion before washing off. Lindane is no longer considered the treatment of choice, because there may be complications in pregnancy (42). Treatment in custody may not be practical but should be considered when the detainee is believed to have Norwegian scabies.